Woody Stoig - erster Freigang, jetzt muss nur noch der über 2m hohe Sockel gebaut werden, das wird ein Zusammenarbeitsprojekt mit dem Woodstoig e. V.
für das gleichnamige Musikfestival. Recycling Künstler Mirko Siakkou Flodin zelibriert hier die vielfältigen Möglichkeiten von Metallfundobjekten die selbst und untereinander viele individuelle Geschichten zu erzählen haben. 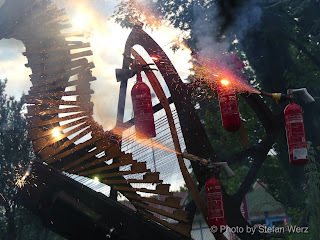 Ein Kunstwerk mit pyrotechnischen Möglichkeiten um ein cooles Festivalerlebnis zu garantieren. Wood Stoig - première sortie, maintenant seule la base de plus de 2m de haut doit être construite, ce sera un projet de coopération avec Woodstoig e. V. pour le festival de musique du même nom. L'artiste de recyclage Mirko Siakkkou Flodin illustre les multiples possibilités des objets métalliques trouvés qui ont beaucoup d'histoires individuelles à se raconter et à se raconter entre eux. 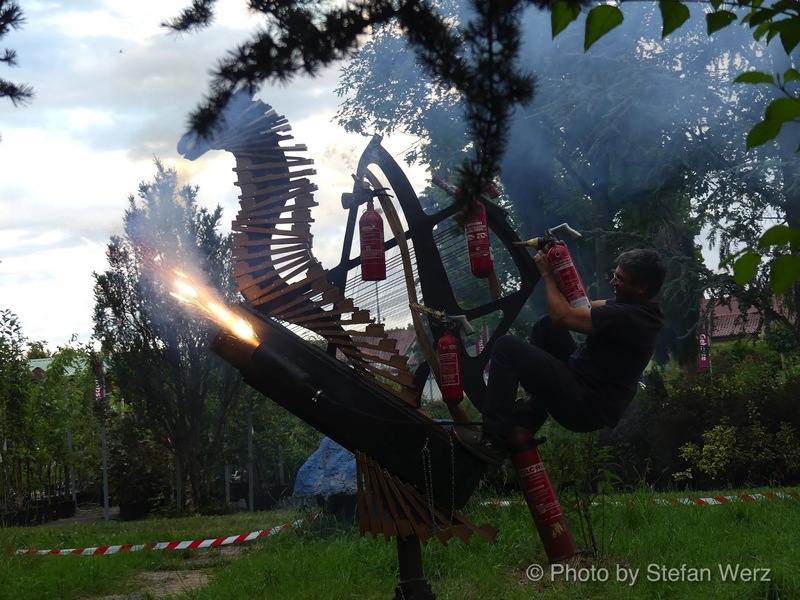 Une œuvre d'art avec des possibilités pyrotechniques pour garantir une expérience de festival cool. Wood Stoig - first release, now only the more than 2m high base has to be built, this will be a cooperation project with Woodstoig e. V. for the music festival of the same name. Recycling artist Mirko Siakkou Flodin illustrates the manifold possibilities of metal found objects that have many individual stories to tell themselves and among each other. A work of art with pyrotechnical possibilities to guarantee a cool festival experience. So entstand die 3m hohe Klang-Pegasus Skulptur, das apokalyptische Szenario wird sich bei Dunkelheit der Ausstellungseröffnung entfalten. - hoffen auf mehr Klarheit nachdem der Rauch sich verzogen hat. Thus the 3m high Klang-Pegasus sculpture was created, the apocalyptic scenario will unfold after dark at the opening of the exhibition. hope for more clarity after the smoke has disappeared. 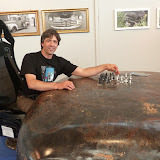 Metallkunst, kinetische Objekte, Metall Design für Büro und Wohnraum, Firmen, Messe und Werbe Kunst, Kunst und Design für private Gärten, Zusammenarbeitsprojekte mit Kindern und Mitarbeitern, Aktions Kunst. Metal art, kinetic objects, metal design for office and living space, companies, trade fair and advertising art, art and design for private gardens, cooperation projects with children and employees, action art. Cedar Rapids IOWA, Artist MO worked with various Metro Alternative School students and Mt.Mercy University (groups of 3-6) to create a kinetic tire art sculpture inspired by the DUNG BEETLE for the Eco Art Festival made from scrap steel and found objects size: 8’ x 8’ x 12’ The Workplace and equipment got generous provided by Kirkwood Industrial Technology Department, Different Departments visit the art in progress. Artist will give one day workshop at Johnson Elementary School of the Arts and art lectures at Mt. Mercy University. 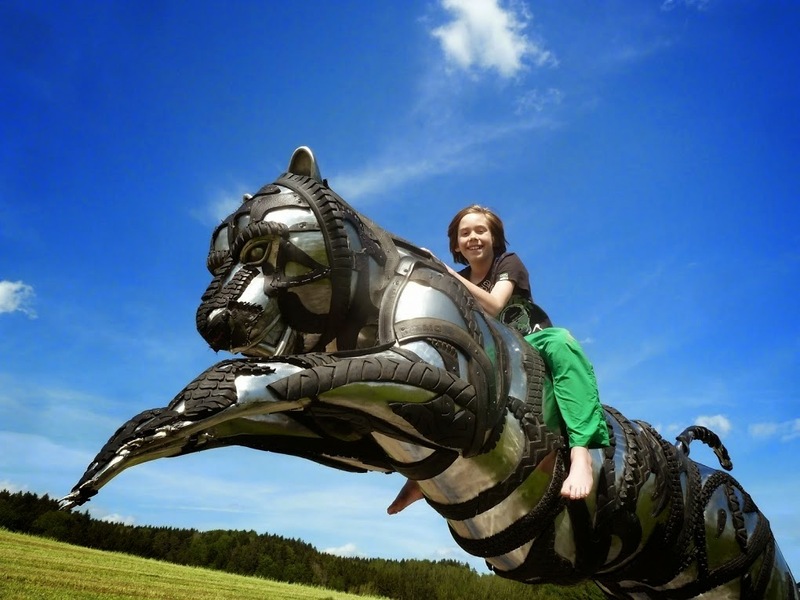 Artist will present the sculpture at the Eco Festival in connection with world wide celebrated EARTH DAY.